In Partnership with Cincinnati Nature Center. Martha, the last passenger pigeon, lived out her last days at the Cincinnati Zoo. Despite efforts to save what was once the most numerous bird species in America, Martha died in 1914. Almost one hundred years later, Cincinnati remains committed to wildlife preservation thanks to local organizations like the zoo and Cincinnati Nature Center, and wildlife artist and conservationist John A. Ruthven, dubbed the 20th Century Audubon. 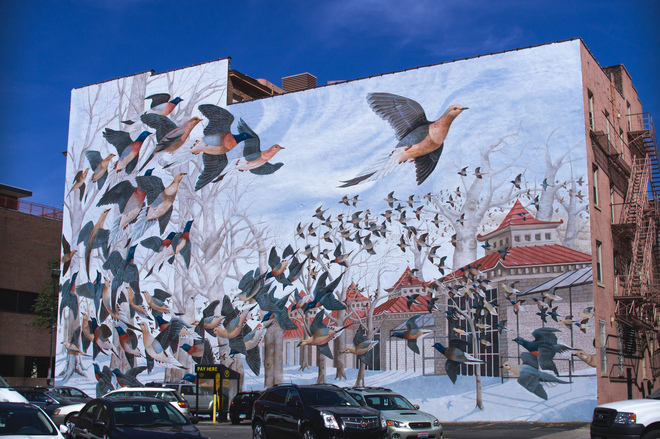 This mural reproduces an original masterpiece by Mr. Ruthven that shows Martha and her flock soaring over the historic Bird Run at the Cincinnati Zoo, and serves as a daily reminder to downtown residents, workers and visitors of the importance of wildlife conservation and the reality of extinction. Special Thanks to Central Parking, McKinney & Namei, LPK, Traction and JeanRo Bistro.